This simple, yet profound statement has always resonated with me. I have found this saying to be true in so many ways both personally and professionally. A few weeks ago, Marianne Porter (my awesome business partner), blogged about the Five Love Languages (if you missed her post, you can read it here). As I read her blog, I totally related with the story she shared because my primary love language is gift giving. When my brother and I were children, my mom (bless her heart) always made sure Valentine’s Day was extra special in our home. I remember coming out to the kitchen on the morning of February 14th and always finding a surprise waiting for me on the table. Growing up with this type of expression trained me to believe that “gifts” represented love and therefore, became my primary love language. Early into my marriage, my husband learned very quickly that ALL special occasions meant gifts – no if’s and’s or but’s about it (bless HIS heart!). As I have journeyed into adulthood, life experiences have naturally expanded my horizons. My Love Language has changed (a few times, okay, MANY times) and I recognize that there are numerous ways to show, give, and receive love. So what do Love Languages have to do with a box of chocolates? In 2010, our family was given a very special gift…a three pound baby boy who arrived eight weeks early! Talk about a VARIETY of chocolates in every shape and every flavor! This little boy (now six years old) was the epitome of life being like a box of chocolates. Every new piece of chocolate we bit into had it’s own unique challenges, struggles, and delicious beauty. Being blessed with a special needs child is indeed a gift. His “challenges” have created a space for our family to grow together, learn to communicate, and understand the importance of finding ways to express love in this box of chocolates. So, what’s been the “box of chocolate” in your life? The sweet (or maybe not-so-sweet) surprises that keep you learning, growing, crying, and laughing? While we’re on the topic of chocolate, it’s almost Valentine’s Day! Next week, millions of people will celebrate by purchasing conversation hearts, roses, and (of course) boxes of chocolates. My recommendation? Skip the calories and the horticultural upkeep…Give your special someone a SWEET and unique gift that will keep you prepared and organized when life hands you something unexpected. 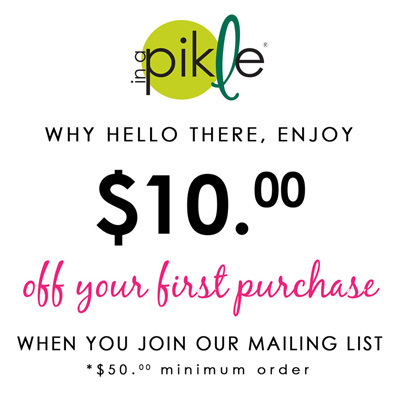 Shop our Pikle organizers here.